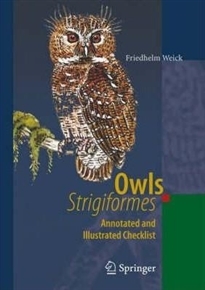 The first systematic owl checklist for over 50 years to include subspecies and synonyms, "Owls (Strigiformes) - Annotated and Illustrated Checklist" provides information on the type locality, habitat and distribution of 220 owl species and 539 taxa, as well as the location of museum collections of skins and mounted specimens, and references to owl illustrations. For each species, detailed, hitherto unpublished, measurements of body length and mass, and wing-, tail-, tarsus- and bill-length are given. In addition to scientific names, the common names of each species in English, German, French and Spanish are listed. The checklist is complemented by many beautiful owl drawings and by watercolours illustrating owl species that have been newly described or rediscoverd within the last 20 years. Reflecting a high level of scientific expertise and the most up-to-date research, this checklist provides an outstanding resource for scientific collections, studies of global biodiversity, and species preservation.